If there is one place that I have never wanted to go, it’s India. Not that I can give you any good reason why. When I think of traveling I would like to do either for sight-seeing or for missions, India is never in the mix. Not just in terms of me not being interested, but I have specifically not wanted to go. And I don’t even remember why I decided that years ago except that I’m sure it had something to do with fear or too much of a life that I don’t understand. (I mean, I’ve eaten a lot of cow in my life). But I did take a little trip to India by way of book this past week. I feel like I’ve gotten to know it a little bit. What I found was confusing but friendly, filthy dirty but lovely. Still not sure I’d really like to go there, but maybe….. 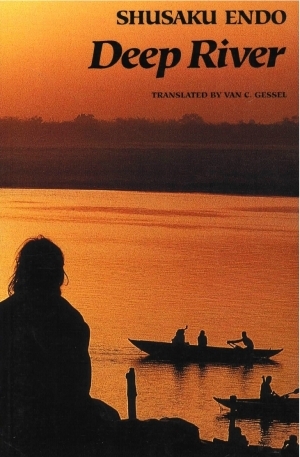 Deep River is about a group of Japanese tourist who have traveled to India on a tour of the holy sites. Except the characters that we get to know in this story are not really interested in the holy sites. They each are on an individual journey in hopes of making peace with their past. Isobe has just lost his wife to illness. In the aftermath of her death he realizes what an inattentive husband he has been. He feels the loss of her companionship more and more everyday and he can’t seem to shrug off the request she made just before dying; begging him to promise to look for her because she feels sure she will be reborn into another life. Isobe doesn’t believe in reincarnation. He doesn’t believe in anything, but he is compelled to grant her wishes and he begins his search for her. Mitsuko is a cruel woman, a man-eater and hater of Christianity. She is one unhappy chick. She does things her own way and in that respect she has herself and others fooled about her happiness, but all she really cares about is humiliating the one guy on her college campus who’s desire is to become a priest. She stops at nothing to hurt and disprove the beliefs of this poor guy. Her misery is that she never can. Otsu is the subject of Mitsuko’s humiliations. He is unattractive, timid and unorthodox in his Christianity. It is from his perspective that you get the philosophy in the story. He certainly does ponder beliefs and matters of faith that run contrary to what he calls “European Christianity”. (I find his questions to be fair). Seeing his faith through his eyes and his understanding of how culture influences what we believe was very thought provoking for me. You get to know a few other characters as well, along with their back stories, and you learn why they have taken this pilgrimage. Some will find what they are looking for, others will not. (Just like life). They all find themselves enthralled at the River Ganges. This is a place full of spiritual symbolism, where worshippers come to bathe in the same water that the dead are deposited into either in bodily form or in ashes.They believe the River acts as a cleansing agent for the sins of humanity just as the blood of Christ does in His crucifixion. The belief is that the River takes you to the next and better place after you die. I really enjoyed reading this one. I knew that I was venturing into some spiritual territory that I don’t necessarily own for myself but it was not offensive and the stories of the characters kept me interested the whole time. It was really easy to read considering that the author is Japanese and the book was translated into English. Deep River makes it’s appearance in LOST in season 6 when some of the LOSTies have found their way to the “Temple” to hide out from the Smoke Monster, and they get to meet yet more people on the island that they have never seen. (I just love saying that stuff, knowing that if you didn’t watch the show, how ridiculous it sounds.) Dogen is the Japanese man who is in charge of guarding the temple and the “sacred” waters that are inside. We catch a glimpse of him reading Deep River in some of his down time. My favorite thing about Dogen is that even though he speaks excellent English, he refuses. He speaks in his native Japanese and has a translator who seriously looks like John Lennon. (I’m certain that was intentional). Anyway, he speaks Japanese because, as he tells Hurley, he doesn’t like the way English tastes on his tongue. So what about you guys? Anybody been to India? Anybody want to go? What do you know about it that would cause you to make your decision? Let me know!